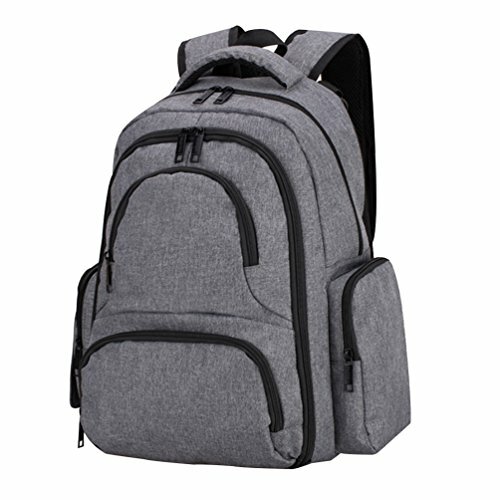 Our Vbiger nursing backpack has extra shoulder strap and top handle, which allows you to carry it as a shoulder bag, handbag, backpack or cross-body bag according to your own need. Besides, this mummy daypack has large main compartment and multi-purpose pockets, which is enough to hold your milk powder, clothes, diapers and other daily supplies orderly. Reassuring Quality- Made of high-quality oxford cloth, ultra abrasion-resistant and tear-resistant, extremely durable to use. Exquisite Craftsmanship- Delicate and neat stitching thread without easily split sewing, helpful to provide added durability. Large Capacity- Large main compartment with multi-purpose pockets, enough to hold your milk powder, clothes, diapers and other daily supplies in order without any mess. Ergonomic Design- Adjustable padded shoulder straps and mesh padded back panel, effectively releases your shoulder pressure and provides the maximum comfort for you. Multiple Usages- With extra shoulder strap and top handle, allows you to carry it as a shoulder bag, handbag, backpack or cross-body bag according to your own need.